When I heard Spike’s school was holding a talent competition, I felt he should be a part of it. So much of school is about what he can't do, what he struggles with. This was an opportunity to celebrate Spike's strengths. We entered a sweet video of him draped louchely over a chair at our dining table, casually answering trivia questions about the London Underground with razor-sharp precision. The next day his classmates talked about the video, excitedly, and I received messages from their parents, marvelling at Spike's talent. One earnest parent enquired, "How did you get him to memorise the stations?". It's not an unreasonable question, but it made me chuckle. The real difficulty would be trying to stop him from drinking up the slithering lines of transit maps, or from insta-filing the station sequences of route maps, or from committing the class and livery of each train encountered to his prodigious memory. Spike's intense interests are a thing to behold. His acquisition of this knowledge seems effortless. Spike’s finds trains rebalancing and restorative. He is not the cliched London commuter, schlepping home through the specific architecture of the railways environs, rendered hum-drum through familiarity. Each mile of electromechanical patter and whine accrues Spike psychological tokens, which he can spend in less blissful settings. He returns home beaming, resilient, with a straight spine. For this reason, we try to accommodate his interest as much as his other commitments allow. When the weekend rolls around, either Ben or I will accompany him on a jaunt to the outer reaches of the Bakerloo line, or to locate a Class 387. This is because we understand that Spike is a hard-working 8 year old. He is a stoic in small packaging, constantly facing challenges. But we also have to try and strike a balance between Spike’s needs and the needs of the wider family. Our “divide and conquer” approach to weekend parenting reduces friction, but erodes our time spent as a unit. To avoid the fraying of family bonds we decided we needed a whole-family weekend ritual. My vote was for bacon sandwiches at a local cafe. Last weekend, we failed to make our appointment with bacon sandwiches, having got side-tracked by a soap foam fight and the subsequent clean-up. Oh well. It is also true that sometimes we would rather not spend our days riding trains. But, perhaps not as often as you might think. At first, I struggled with these odd journeys and pressed Spike to travel to a destination where there was something to see or do - a museum, a park, shops. But, determined to meet him on his terms, I learned to relax. I people watch, I eavesdrop, I discover new parts of my city and connect them to more familiar geography. Make no mistake: this is top-quality Spike time, too. So rather than trying to restrict his interest (which would be fruitless and serve only to damage our relationship with him), we try to expand and broaden Spike’s horizons; we sketch in new zones of interest and lines of enquiry on his mental route map. We also look for opportunities to leverage Spike's passion for trains. This might seem a little cynical but, while I think special interests are a powerfully positive force, they can become consuming. They can take over every conversation, every thought, if you let them. We want rail to be Spike's sanctuary, but not a hiding place. As well as stretching his interests, we look for opportunities to make them functional. We encourage Spike to be a good traveller. There is little point loving trains, but not being able to travel safely on them. We ask him to prepare a list of what he needs to pack, to plan journeys in advance, to consider alternative routes. We are teaching him to observe signage in order to navigate stations and to behave safely and well on platforms and in carriages. It is notable that a good train journey can elevate Spike from despair to elation. But a line or station closure can send him plummeting into a black hole [shakes fist at TFL]. The intensity and singular focus of his special interest and of the emotions it inspires seems akin to falling in love. There is an obsessional desire to drink in each small detail and to devote every moment of wakefulness to thinking about it. Run-of-the-mill hobbies - a flirtation with embroidery or barefoot running - appear shallow and transitory when measured against an autistic special interest. The progression of Spike’s focus from letters, numbers and shapes, through to film studio logos and idents - Universal, 20th Century Fox, Disney* and then onto logos from the high street, arriving at the famed London Underground roundel and, finally, at trains is an evolution of sorts. It makes sense. And so, I should have known it would happen: the segue from trains to buses, from rail to road. Arriving at a train station prompts a tiny fizz of excitement. Less so since I have had children, admittedly, where a surplus of baggage and unpredictable juveniles mean the fizz is more like a cortisol spike. But there is a sense of possibility and a straight, swift line to your destination. Bus stations, on the other hand, are dank and smell of despair. Bus air is stale and - impossibly, too hot and slightly too cold. The windows get sweaty. Buses lurch and get stuck in jams. Despite their iconic, cheery red shell they sometimes feel drab. A little piece of me hopes this segue is a sub-interest (which can pop up and burn brightly before extinguishing). It is possible, however, that we are at the dawning of the Bus Era. So, for the past couple of weekends, I have been practicing "enjoying the ride". There is a whole new vocabulary to swot up on - Abellio, Arriva, Alexander Dennis. A new design language to learn and many more eye-catching combinations of moquette and pole colour. Like trains, buses represent shared journeys. They are a public space. But the relative cheapness of a fare, the intensely local routes and the interactions with other road users make buses feel more humane. Bus passengers are famously less inhibited than those travelling by rail which, weirdly, makes me feel both safer and more vulnerable. On trains, the seats dictate that passengers must face one another. It is a confrontation of sorts. It forces you to look at your shoes. The serried ranks of bus seats, facing the direction of travel, give the illusion of privacy. Conversations proceed as they might across a kitchen table. A weekend or two ago, I gritted my teeth and, at Spike’s request, embarked upon a journey culminating in a bus ride from Harrow & Wealdstone to Watford Junction. As the bus puttered into Bushey, the gentle mound of the heathlands hove into view beyond the antique high street and my spirits lifted. Buses give you a better sense of the geography of a place. The architecture of life is just outside the window, rather than an austere railway embankment. And I’m still not driving, which is excellent. Accepting change is one of the pillars of our work with Spike. In life “Cold things grow hot, the hot cools, the wet dries, the parched moistens**...” and we, as parents, are arbiters of the approaching moment. We decide how much to protect him, how much sameness to concede, how much to expose him. We seek a fine balance between offering him a refuge and building resilience to the flux of life. And Spike is changing, too. First trains, now buses. I also need to accept change, and flow. * Spike can write fluently in Disney font! ** Sorry for inflicting the word "moistens" on you. Want to read more? My autistic son's true love. In her New York Times article, Cammie McGovern very eloquently and movingly describes her struggles with the process of securing provision and, ultimately, employment for her autistic son. I have not become inured to setting out in plain words, the ways in which my child is not like other children. When Spike was younger, detailing our concerns was quite a simple exercise, "He is not pointing. His words are not coming quick enough. He seems obsessed with fans." His eccentricities formed a collection of off-beat quirks, which belied the inherent seriousness of their presence or absence. As he got older, those differences fleshed out and took on weight. It takes longer to paint a picture in words of our autistic child, who perceives his peers as primarily a source of unwanted sensory disturbance, or who finds that his teacher's words turn from concrete, meaningful symbols to water as her language moves into a more sophisticated register. Detailing the many points of divergence between Spike's development and what is typically expected is an exercise running to many pages. We read them back to our selves, checking for balance and veracity. By our hand, these accounts are merely quick sketches of Spike, but we try very hard to be faithful to our boy, so that he is there, among the words. A bright, cheerful boy with passions and interests, a creative streak. A boy that requires a gentle, consistent, step-wise approach to teaching and to tolerating the perceived assaults of the modern world. A boy who needs a little more time and space, to process your words and expectations, and to recover when he is feels tossed in an audio-visual sea. When we met with Spike's paediatrician for the first time, the words poured out of us like milk. We were grateful for a chance at certainty after months of carrying around this leaden question. "Is he autistic?". Diagnosis represented a rubber stamp on our passport, permitting us to go forward and get on with it. To move forward linearly, and not in circles. I do not know how many times since we have had to enumerate and qualify Spike's abilities and disabilities. Quite often, our words are taken up by a psychologist or paediatrician and translated into specific medical jargon. Uncertainty is stripped away. "Challenges" and "difficulties" become "deficits". The shape of your child's condition is sharply defined and, in vulnerable moments, it collides with how you thought things might be. In the disability community and beyond, the idea that we should be focussing on strengths and not deficits is gaining sway. Research shows that, at least in certain contexts, deficit-based systems are ineffective compared to their strength-based counterparts. The use of a collaborative approach which focuses on the assets of an individual should increase resilience and independence. It also feels more humane and guards against conceptualising an individual in terms of their challenges. It's something woven deeply into the way we support Spike, so I am pleased that Britain's local authorities and support services are making steps towards a more progressive attitude. However, I am also concerned that there is a lack of resources to enable full engagement with and understanding of this quite different way of supporting our vulnerable citizens, and that people may suffer as a result. The forms we complete to access local authority funding for Spike's therapy are a rather watered down version of a strength-based system. There is no real drilling down into how Spike's strengths can be sustained, developed or utilised to support him in areas that he finds more challenging. No one has the time or money for that. So, instead you are left with a rather hollow list which seems to serve the purpose of a patronising, patrician reminder that "it's not all doom and gloom". We don't need reminding of that. Spike is awesome! We are not wringing our hands at our fate. The strength-based system should also not mean that challenges are ignored, or struggles spun into strengths as an excuse to cut much-needed funding to families. These review processes invariably conclude by looking to the future. What do we want for Spike? What do we see him doing? These questions feel impossible to answer. Ben and I have struggled with our inability to look very far ahead. Of course, no parent can be certain of what the future holds for their children. No matter what opportunities a child has, life is unpredictable and parents can only do the best they can with what they have. But when I consider Oscar, the future seems a bright place. A jumping off point to multiple paths. The possible futures diverge wildly from one another, but I see them. An autism diagnosis brings down a heavy cloud over those paths. They may exist, but sometimes seeing your own hand in front of you is the greater challenge. Statistically speaking, most parents can expect that their child won't be President of the United States. They can also expect that their children will find employment and live independently, that they will have romantic relationships and be able to pursue their enthusiasms. Can we be certain of those things? Ok, we probably don't have a future President on our hands. Joking aside, in the UK, only 16% of autistic adults are in full-time employment. Only about 17% of young adults on the spectrum aged 21 to 25 have ever lived independently. That's a specific autism problem. Double the number of non-autistic, intellectually disabled people have lived independently at that age. That is tough reading for families with autistic children, and tougher still for the autistic adults living the experience. When Spike was diagnosed with autism, we asked the paediatrician about what Spike's future might look like. He would not be drawn and I accepted that. Spike was 2.5 years old! And so I put off thinking about Spike's adulthood and the far, distant future. But the future is coming and prudent people plan for it, so we try and engage with these questions about where we see our boy. As children grow, all parents can pare away some of these hypothetical future paths. A line is drawn through "concert pianist", "fine artist" and "theoretical mathematician". I can see that the paring process for families like ours and McGovern's is more brutal. While we face many similar challenges, we are not as far down the road as McGovern and Spike does not have the same level of learning disability. He is hard to pin down. Professionals describe his profile as "spiky" (how apt! ), with areas of both great strength and challenge. Like many autistic kids, motivation and engagement are sometimes significant barriers to learning, but if he decides to learn something, well - he might be as able as the next kid, potentially more so. And so we are tantalised by the possibility of these paths. Which of them should we attend to? Thinking pragmatically, Spike's future is probably not going to follow a typical trajectory, but how far off the trajectory will it be? These are the questions which make planning for the future so difficult. Humans have a strong need to be able to predict. If we can predict, we can control the variables and adjust for the optimum outcome. Some futurists have described a taxonomy of futures - the possible, the preferable and the probable. Ben and I spend a lot of time cycling between these taxons, making plans for the probable, sometimes struggling to fully commit lest we eliminate the possible. To as great an extent as possible, we must let Spike lead. I mean, of course we must. It's easy to lose sight of that though, when worrying about whether he could or should do GCSEs, or when trying to strike the right balance between traditional schooling, supporting his areas of need and just being a kid. What is preferable is that his future (and the future of all children regardless of the challenges they face) contains opportunities for him to be joyful and content. It is patently clear what makes Spike happy. In the end, we must guide him to show us the future he wants. We'll work as hard as we can to ensure that it is built on sturdy foundations. I cried mixed-up tears of I'm-not-sure-what-emotion as I read McGovern's concluding words, "Your future should look like the best parts of your present". Well, there's something wonderful for us all to aim for. Want to read more? Where the future started. I was travelling on the train with Spike last weekend and we sat opposite three young teenagers, perhaps 13 years old. As always when we travel by train, Spike was delighted to be there. He chatted to me constantly, asking questions and telling me facts about the stations we passed and the lines we travelled along. I love this Spike. Interactive. Engaged. Wanting to share his enthusiasm with me. His joy was palpable, evident in his excited bouncing, his slightly-too-loud voice and his frequent gasps of excitement. The children opposite were sneaking looks and not quite managing to suppress their nervous giggles. They weren't being purposefully mean. I could see they were trying to be discreet, but couldn't quite help themselves. There was no adult nearby to explain what they were seeing and to shape their response. They were reacting to a perceived strangeness in my son. It made them uncomfortable. I felt sad. Spike was, I think/hope, unaware of them. Too wrapped up in his journey that he waits all week for. I was sad because this discomfort is a precursor to fear. It erects barriers between the observer and the observed. Makes him other. Not one of us. Excludes him. I wanted to - was going to say something, but our stop was coming up and my brain decelerated along with the train. What could I have said? I'm still not entirely sure. My urge was to tell them him how brilliant he is, to let them know that his difference is not diminishing. He is not a half-person. In the end, I hugged him, laughed with him and told him how clever he was for knowing so many cool facts about trains. "See? My son is loved and loveable." A simple, "My son is autistic. He knows a lot about trains, doesn't he?!" would have given them a frame of reference which may have prompted a different, better response. It would also have conveyed that they had been observed, and that they should be more mindful of people's feelings. I will do better next time. In the main, we don't encounter this sort of thing very often. Perhaps it is because we often pre-empt any concerns by letting people know Spike is autistic. We'll explain that they might, for example, need to make sure they have his whole attention before asking a question. I'm struggling to remember another incidence of unkindness (accidental or otherwise) right now. Isn't that wonderful? I do, though, recall the lovely people - the men and women who chose not to judge or fear. I remember the man who thanked Spike for reminding him to get off the train at his stop, and the man who told Spike that TFL would snap him up when he grows up. The numerous people who took the time to say what a lovely, happy boy Spike seemed. The woman that stopped her car and brought me a pillow from her back seat when Spike hurt himself and had a meltdown on the street. The station attendant who calmed Spike and helped keep him safe when he was acutely distressed and unable to hear us through the fog. When you are young and autistic, unusual behaviours don't stand out as much and are often tolerated or dismissed. As he gets older, I am keenly aware that Spike is more conspicuous and that people's reactions may not always be so lovely. We are, of course, teaching Spike about social expectations, and how to regulate himself in public. But I think it's fair that we have different expectations for him depending on whether we are riding a week day tube, packed with quietly sullen commuters, versus a train filled with lively, lanyarded fans spilled out from Wembley. They were noisier, rowdier but, on that day, Spike still stood out. And I missed an opportunity to make the world better for him. Don't pity my son. If you pity him, you assume he is suffering and unfortunate. He is a happy boy, with deep passions which bring him joy. He is surrounded by people who love him or hold him in deep affection. They are invested in his happiness. If you pity him, you are writing him off. You are implying that his life is a tragedy and that he cannot be successful (which is a subjective, not objective measure). Don't pity us, either. We have two amazing boys, we are privileged, educated people. We are lucky. Spike is well supported in a way thousands of autistic children in this country are not. Nothing about that warrants your pity. Don't assume you know my son, because you "know" autism. My son is not autism. He is Spike! Human beings are are the most wonderfully sophisticated, complex organisms and we should take the time to get to know each other. When you meet a neurotypical person, you may make certain assumptions about them. I think we all know assumptions are a social short cut and to be avoided but, as humans we are more alike than different. Statistics and probability may see your assumptions borne out, more often than not. But you will come unstuck if you assume things about Spike. Not only is it impossible to map a neurotypical worldview onto Spike's, he is inconsistent - consistently so. You cannot even assume that what worked yesterday will work today. Instead, spend time with him, or speak to the people who know him well. Figure him out. Spike's silence does not mean he wants to be alone. His fidgeting and averted gaze does not always mean he is not listening. Some professionals who have worked with us have been guilty of this. To give them the benefit of the doubt, they may have been unable to go any deeper, too hamstrung by budget and caseload to look at what will help Spike, rather than Generic Child with Autism. Unless you are assuming a desire to be loved, heard and included, don't be presumptive, be curious. If you fear my son, you make a monster of him. I have encountered adults who are scared of Spike. There are people who have been a part of his daily life, but find themselves too fearful to interact meaningfully with him. I don't blame those children on the train for being unsettled by Spike's idiosyncratic behaviour. I hope someone will teach them about autism. But adults have a responsibility to educate themselves (and their children). Knowledge defeats fear. He is a child. He will be a man. He deserves understanding. Be curious! This is the best response to hearing about an autism diagnosis. I love it when people are curious about Spike because I have seen, first hand, the difference it makes to him. Children are often naturally curious and parents, fearing social embarrassment, can be too quick to suppress this natural desire to learn. Let them ask questions! Start a conversation yourself, if you can see your child is confused or anxious. Engage. It makes a tremendous difference to Spike if people ask how they can include him, how they can communicate better with him, what makes him tick. Spike is constantly, relentlessly pulled out of his comfort zone into the neurotypical world. When people take the time to meet him in the middle, it means he doesn't have to do all the work. He is a hard-working kid. In time, I hope he will be able to advocate for himself and tell people what accommodations he needs. Until then, help him out. Want to read more? Unravelling my son's love of trains. Spike spoke his first word with his hand. The sun had risen late and bright on a winter's day, its incendiary rays dissolving the darkness at the edges of the blind. I pulled a cord and the blind folded up on itself, and light flooded the room. Spike lay sleepy amongst the rumpled sheets of our bed. He squinted, raised his hand next to head and opened and closed his pudgy starfish fist. He had made the Makaton sign for "light". We were charmed by it, as all parents are by the child's first words. I don't think we gave any thought at all to the abstract nature of the concept he had chosen to communicate. Not "Mama". "Light". At 9 months, Spike's soft brown hair stood vertically as if plugged into an invisible Van de Graaff generator or, perhaps, rising to the occasion of his name. He was gorgeously chubby, berry-brown. He glowed. I was biased, of course, but the dozens of strangers who stopped me in the street to tell me how beautiful he was* (and, on two occasions, to give me money for him!) seemed to agree with me. The months prior had been punctuated by recurrent wisps and tendrils of discomfiting thoughts. They wafted in like sizzling blue bottle flies. Usually, I swatted the thoughts firmly away, but they were anchored to something heavy and unyielding. I know Ben had them, too. We only occasionally articulated them to each other. Had we said the word "autism" to each other at that point? I can't remember: we'd definitely thought it, though. Just as now, Spike was hard to pigeonhole. People would ask "Is he an easy baby? ", presumably seeking some broad assessment of sleeping and eating habits and temperament. It was a difficult question to answer. We certainly were not sleeping very well. Shortly after birth, Spike had settled into waking every 3 hours through the night. Attempts to stretch the intervals were fruitless. He was like clockwork or a Japanese train, and remained that way for a long time. He found it hard to settle for naps, regardless of how early or late or consistently we attempted to put him down. In the end, we discovered that rapid, rhythmic rocking fought the calls to wakefulness or, failing that, a trip out in the pushchair. Once asleep, he would nap heavily for 3 or 4 hours easily as if exhausted, and we would have to ensure we woke him before the afternoon slipped by. He was disinterested in solid food and gagged on much of what we offered. He didn't like to be cuddled too closely. From the moment, he could support his head, his preferred position was on my lap or in my arms, facing away from my body. But he was undemanding in other ways. I noticed him, watching the afternoon's golden sun beams pouring through the living room windows like syrup. His eyes following the light in the room and not the faces. At home, words like "contented" and "self-contained" occurred to me as we read books and played peek-a-boo. He didn't really cry unless he was tired or hungry. I could easily prepare dinner without him fussing. Occasionally, I would feel a little pang. Babies were not meant to be "self-contained". They were meant to need their mummies. During pregnancy, I had signed up to a weekly baby development email ("Your baby is now the size of a kumquat!"). They continued after birth and I sometimes had trouble reconciling our experience with those frothy and presumptive missives: "Your baby can pick your face out in a group. He will be fascinated by your face and full of glee when someone familiar comes near". Nope. Could we swap "face" for "light, shade and ceiling fans"? Autism? That word and its question mark echoed through the following months. In the small hours of the night. While feeding Spike and with my store of will power expended, I would petition Google with incoherent strings of keywords, "poor eye contact ceiling fan hates clapping" and feel not concern or despair, but strangely out-of-body as I scrolled through the results: "Classic sign of autism appears in early infancy", "'Red Flags' That Warrant a Referral", "Worried about Autism at early age". Outside the low-stakes confines of home and immediate family, things were more challenging. I took Spike to baby-signing classes. However, it quickly became apparent that Spike detested clapping. After each song the group would applaud themselves and Spike would stiffen like a plank and scream, setting off a Mexican wave of infant distress. I persisted for a while, thinking he would get used to it, whispering "Clapping now" before the noise broke out. It got worse and the pleasant facade of my fellow mothers slipped, so we left. It was also very hard to leave Spike with anybody, well before the age that separation anxiety usually kicks in. Grandparents and friends would offer to watch him while I went for a walk or a coffee. When my absence became apparent to him, he would become hysterical, inconsolable, keeping up wracking sobs until I returned or he exhausted himself and fell asleep. I remember standing at the bus-stop en route to Sainsbury's, with a day-old Spike snuggled against me in a wrap and Ben by my side. It was unseasonably warm and I was glad of the fresh air. I noticed an older lady studying me. After a while, she said kindly, "You're doing well, aren't you?". I promptly dissolved into floods of tears. I must have been a walking embodiment of "post-partum". Utterly under the spell of my new baby, riding out the hormone crash, moving tentatively to protect my tired, bruised body. As the tears streamed out of me, I thought "Well, this is odd." Of course, this volatility subsided, but I sensed that having a child had dismantled me. My internal landscape warped as surely as if it had been struck by an earthquake. As the months (or, perhaps, years) go by, you reconstitute and become whole again. But the effect of questioning your child's neurology is to set the foundations moving under your feet. In the early years of motherhood, there was a lot of white noise, scrambling, interference. Meanwhile, Spike was whole and perfect. In time, we would be able to set aside the seething nest of words that plucked at our nerves: "disorder", "delay", "deficit" and just see our boy. The effects on Spike of being out in the world left me with a choice between the tranquility of home or bracing myself for one of the draining and upsetting meltdowns which increasingly punctuated our social excursions. The latter often left me feeling more isolated than if I had never left the house. I did go out, though, and the volunteers at the local Stay-and-Play got used to keeping one eye on the door, where Spike would remain, pressed to the glass like a distraught octopus in a tank. I drank weak tea, nibbled a digestive and tried to feel like I thought the other mum's must feel. I should say that I loved Spike fiercely and earnestly from the second I held him, and we were well bonded. I was used to strangers falling a little bit in love with him as we went about our business. Even now his unfiltered joy and openness is infectious. He is shooting up - 8 years old, but his magnetism has not yet abated. A couple of days ago, on a train (obviously), a lady came down the carriage specifically to talk to him and to say "Isn't he a lovely boy? So happy!". So, while we adored and revelled in our gorgeous boy, there were unmet milestones and "red flags" flapping noisily at us. They demanded certainty. We wanted a diagnosis. We put off going to the GP, knowing that Spike was still young and there was a high chance we would be told to "wait and see". But, by two years old, Spike's speech delay was quite apparent. His vocabulary was small and esoteric, and his phonology was disordered to the extent that it sounded like he was speaking a different language (we sent a 'phrase book' in with him when he started nursery). He called me "Undee", not "Mummy", which I loved and hated by turns. It was at this time we went to the GP, with our concerns written out in full, and asked to be referred to the multi-disciplinary team for assessment. We were referred, no questions asked. Diagnosis was a process which stretched across a few months. There were interminable questionnaires to complete and interviews to participate in. By far the worst bit was the speech and language therapy group assessment. For an hour each week for a period of 4 weeks, seven roughly nursery-aged children and their mothers were gathered in a tiny, stuffy room in a clinic. A few toys were set out on the floor, and about 4 or 5 therapists circled the room with clipboards dispassionately making observations on the interactions between child and parent and child and therapist. I can tell you the "interactions" mainly consisted of screaming, crying, meltdowns and dissociation (I'm trying to restrain myself from writing "...and that was just the parents!"). I am reasonably confident that every parent left at least half of the sessions in tears, and the children, Spike included, obviously found it very stressful. I do hope that they have since found a more humane way to gather the data needed for diagnosis. But at least our concerns were being recognised. For many, seeking diagnosis is like pushing on a heavy door. You have to throw the whole weight of you behind it. And then on diagnosis, the door is flung open, unceremoniously, and through it you fall. And it will feel like there is no one to help you up. We had access to speech and language therapy from our initial appointment, but beyond that, nothing. On diagnosis the paediatrician was at pains to tell us he could not make any recommendations in relation to helpful therapies, nor could he make an assessment of the level of Spike's needs or the support he might need. Neither did he point us in the direction of any organisation, local or otherwise, which might be able to support us. It was pretty brutal. Fortunately, we were braced for impact. The diagnosis was expected. Ben has a First in Neuroscience. I had read enough about autism in the preceding two years to write my own book. We would figure it out. I probably don't need to say that it's harder when it's your kid and not a case study, but 'figure it out', we did. I can't pretend it's always easy. Public meltdowns are never the high point of a day. Navigating the content and delivery of Spike's education is fraught with doubt and stress. We're still learning how to meet Spike in the middle. Sometimes we fail and do too much or too little. Our troubles are all with the world outside our door, though, or a result of our misjudgements. Well, I say "all", Spike is as cheeky and prone to defiance as the next kid. 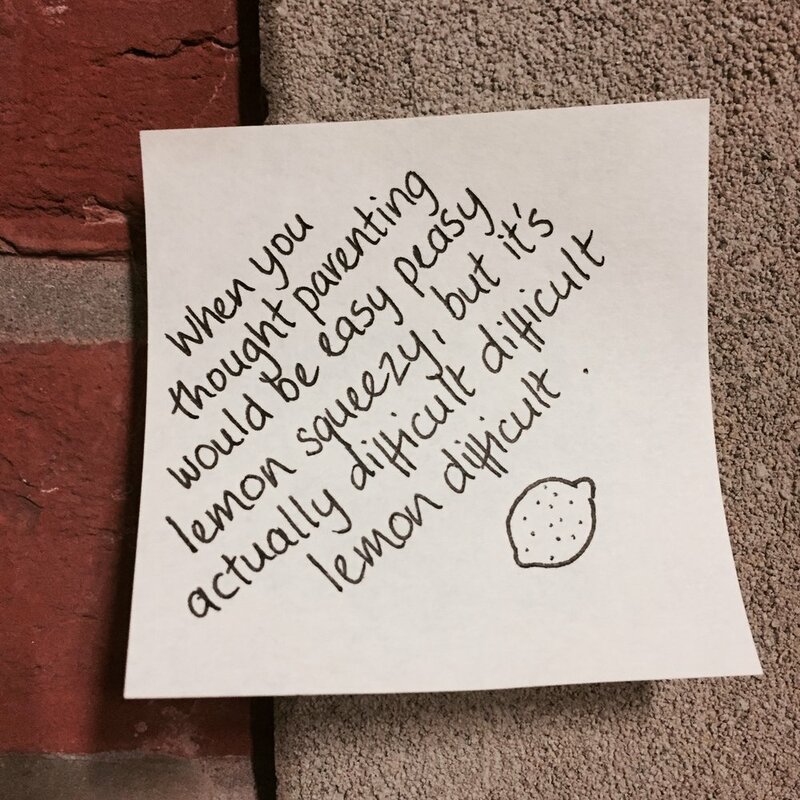 Balancing the needs of everyone in the family can be tough, too. But for now - there is Spike bent double in the street, crying with laughter as he remembers farting on the train. There he is, solemnly touching the nose of a class 900 train with his nose, as if meeting an elder of his tribe. There he goes, setting off at a sprint, looking back over his shoulder and calling out "CHASE me, Oscar!". ^ If you find yourself in this position, my suggestion would be to say something along the lines of "You must be tying yourself up in knots about this. Go to the GP. Get an evaluation. You'll feel better if you know one way or another." Want to read more? How people react to my autistic son.